The Mad Hatter Syndrome is the result of a chronic mercury poisoning among (mostly) hatmakers whose felting work involved prolonged exposure to mercury vapours. The use of mercury in hat making started in 17th century France and proceeded to well into the 20th century. During the reign of Queen Victoria (1819-1901), the Mad Hatter Syndrome had even become proverbial, as reflected in popular expressions such as ‘mad as a hatter’ and ‘the hatters' shakes’. Symptoms of chronic exposure to mercury, leading to the Mad Hatter Syndrome included tremor, muscular weakness, mental confusion, emotional disturbances and irritability. Furthermore, poor memory, pathological shyness, insomnia, nervousness, tremors and dizziness are reported. The best known description of the Mad Hatter Syndrome was the Mad Hatter, the iconic character in Alice’s Adventures in Wonderland by Lewis Carroll. 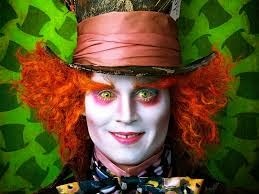 Johnny Depp played him to perfection in his role in the movie Alice in Wonderland.